Course participants have a lot of fun trying to throw one another as in Judo. Then they adopt their kungfu stances and feel the difference. Grandmaster Wong shares with them a secret he learned from his master, Sigung Ho Fatt Nam, many years ago, which is “chow ma woon pou”, meaning “move stance change step”. With this secret, opponents find it difficult, if not impossible, to throw you. Nick and Sifu Anthony have some fun at Judo. Though both are skillful neither one could throw the other. 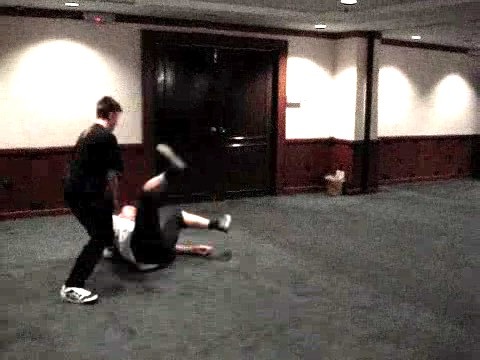 But eventually Nick throws Sifu Anthony onto the ground. Can you see the crucial factor? In the eventual throw, Nick uses kungfu stances. Nick and Adam, who are brothers, have some fun trying to throw each other. Now they use kungfu stances, and not standing with feet apart as in Judo. But Grandmaster Wong explains that though they use kungfu stances, they are leaning their body forward, which is a disadvantage. The size of the video clip is 1.29 mb. Grandmaster Wong demonstrates that when he sinks down into his stance , it would be difficult for a Judoka or any martial artist to throw him. In fact he can off-balance his opponent. Further, he would not allow the Judoka to hold him as in Judo; he would use kungfu patterns to subdue the opponent. Grandmaster Wong goes on to explain that by just “moving his stance and changing his step”, or “chow ma woon pou” in Chinese (Cantonese), a Judoka or any opponent could not fell him. He would also exploit the opponent's weakness and counter-strike, like kneeing the opponent's chest or kicking the opponent's groin. The size of the video clip is 0.87 mb. As Chris moves in to throw Nick, Nick frustrates Chris' attempt by using footwork to neutralize Chris' leverage. Grandmaster Wong shows the superiority of kungfu by using stances. 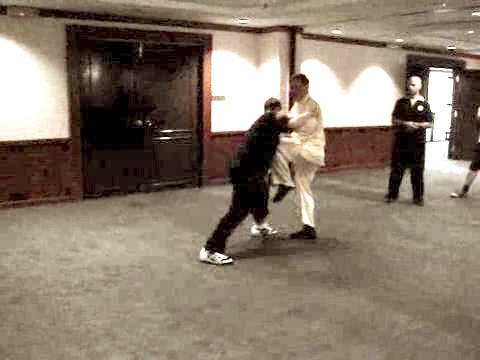 As Chris attempts to throw Grandmaster Wong, the grandmaster sinks into his stance, and behold, Chris is on the ground! This pattern is known as “Black Bear Sinks Hips” in Taijiquan, and as “Tame Tiger Listen to Wind” in Shaolin. The size of the video clip is 0.69 mb. Now Nick applies “Tame Tiger Listen to Wind” to counter Chris' throw. It is illuminating to note that Chris is much bigger in size and heavier than Nick, yet Nick can throw Chris almost effortlessly. Shaolin Kungfu does not depend only on size and weight. The size of the video clip is 0.67 mb. Sharing the Secret of Move Stance Change Step from Wong Kiew Kit on Vimeo.